Pure Lake Park is a popular day-use destination for local residents who enjoy fresh water swimming and picnicking. 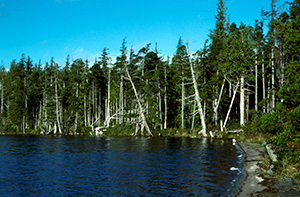 Pure Lake Park is located approximately 19 km south of Masset on the Queen Charlotte Islands. A short trail leads from the main road to the picnic area. Parking is available at the highway pull-out. History: Pure Lake was originally designated as a land reserve in 1958, then received Class A provincial park status in 1981. Cultural Heritage: Pure Lake Park lies within the asserted traditional territory of the Haida First Nation. Conservation: Pure Lake Park is located in the Queen Charlotte Lowland Landscape. The park completely encompasses and protects Pure Lake. There are kayaking and canoeing opportunities in this park. There is a short walking trail to the lake only, no trail development around the lake. For your own safety and the preservation of the park, obey posted signs and keep to designated trails. Shortcutting trails destroys plant life and soil structure. You can swim in the lake but there are no lifeguards on duty at provincial parks. Campfires are permitted. Please note that firewood is not provided and visitors must bring their own. To preserve vegetation and ground cover, please don’t gather firewood from the area around your campsite or elsewhere in the park. Dead wood is an important habitat element for many plants and animals and it adds organic matter to the soil. You can conserve firewood and air quality by keeping your campfire small. Limited burning hours or campfire bans may be implemented and some parks may use communal fire rings. Be prepared to bring a portable stove for cooking. This park has a day-use/picnic area. Five picnic tables and two fire rings are provided for day-use. Please note that firewood is not provided and visitors must bring it with them.